On April 10, 1954 this world was graciously honored by the presence of this blessed anointed Man-child. He was gifted with many talents and at a young age his father and mother observed them. He began at age of 2 years to play the pot and pans in his mother’s kitchen. He then graduated to toy drums, and then a to a real set of drums, which he played to the glory of God. The story of how he got his set of drums is one involving the measure of father he was gifted with. He and his family were out looking at instruments when is father heard him say “God is going to get me that set of drums.” His father and mother sacrificed to buy those drums, and God got him those drums (using his parents as the blessing to com through). In September of 1969 he began to use another gift. He played the organ to the Glory of God, and the church was blessed. He began to realize that God had gifted his hands, and he could make music on anything that his hands touched. He played the drums, piano, guitar, trumpet and organ. He sang in the choir, directed and formed a choir. The Lord continually blessed this Man-child as he was nurtured in the fear and admonition of God. Charles graduated form Camden Senior High School and attended Camden County College, both in New Jersey. He also attended Pennco Technical Institute of Electronics in Bristol, Pennsylvania. Charles received an Associates Degree in Specialized Electronic Technology. At the age of 7 years, he heard the Voice Of The Lord audibly call his name three times. As Samuel was advised, Charles' mother advised him to say, "Speak lord They Servant Heareth". His spiritual life as up and down, until about 1:37 PM, Sunday afternoon October 19, 1986, when he surrendered his life to the Lord. He received the Blessed Gift Of The Holy Spirit, which was the greatest give he had ever received. Charles realized that the hand of the Lord was upon his life. He immediately began the work of a Deacon, and informed his Pastor that God called him to Preach the Gospel. Among his church activities; he led; Prayer, Shut-ins (which he called all night prayer vigils), taught Sunday School classed, Praise and Worship, Devotions, Counseled families and youth, prayer in homes, ministered to those hospitalized and led Bible readings outdoors. 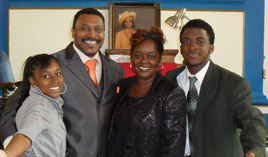 In August of 1987, Minister Charles Edward Giddins Jr. received his ordination papers. That day was one of the greatest achievements of his life. God blessed him with a Ministry of praise, healing and rebuking death.